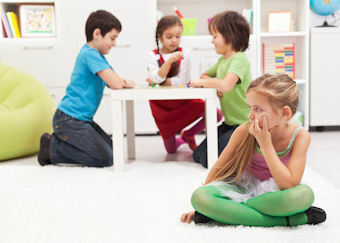 Learning about themselves and what makes them unique and special is such a fun way to introduce children to more formal learning. After all the child is already the expert! All About Me activities are excellent start of term ice-breaker activities to help teachers and group leaders get to know a new bunch of children. We've so many drawing activities, fact files, booklets, games and much more to enjoy and print that you are spoilt for choice. 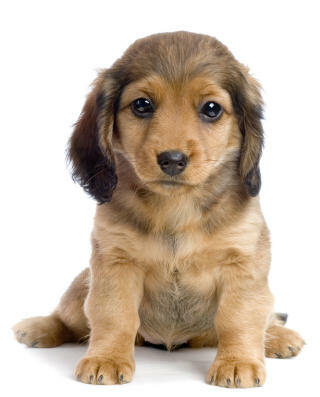 Pets are a favourite topic for a lot of children, so they're bound to enjoy filling in this About My Pet worksheet. There are some simple questions to answer, and space to draw a picture of their pet too. This All About Me At School worksheet is a perfect activity for the new school year. It'll help the children learn about their new class and teacher, and also encourages them to write about what they enjoy at school. It's good for kids to learn about themselves and what makes them unique. 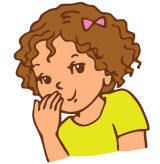 This All About Me booklet is a different way for kids to record information all about themselves. Simply print and fold the booklet, then get the children to fill in the information and draw a picture of themselves on the front page in the frame provided. We love this clever activity to get to know a new group of children, perfect for the start of the new school year! Print out copies of our All About Me bunting, give a copy to each child and ask them to fill in their details and draw a picture of themselves. Brighten up the classroom and get to know the kids at the same time with this clever All About Me bunting. Give each child a flag to fill in and ask them to draw a picture on the back. Cut out the flags and secure to ribbon or string ready for a fantastic display. Here's a fun worksheet that's ideal for younger children. Can the kids fill in each of the activities on the worksheet with their favourite things? They need to think about their favourite food, favourite colour and a few other items too! UK and US versions below. Our physical characteristics worksheet is a great activity to help teachers get to know a new bunch of children, whilst teaching the kids how to describe themselves and learn about measurements too. We have metric and imperial versions available to choose from. 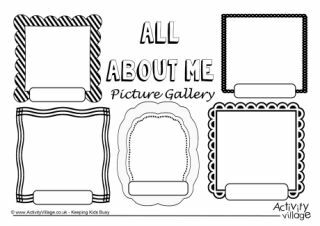 Get each of the kids in a group or class to draw a picture of themselves in our All About Me picture frame and fill in a few details, then display in a group on a classroom wall. Here's a fun worksheet that's a great icebreaking activity for a new school term or for children joining a new club. 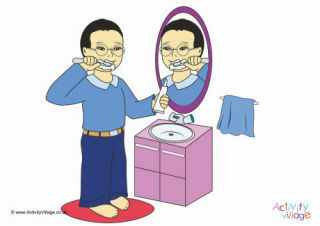 The kids need to draw a self-portrait and answer some fun questions including what their nickname is if they have one! Print this page onto coloured card, slice up the pieces and fill in the blanks. Confident writers can fill in their own but for younger children you might want to do the writing for them. This was a very successful craft, but we did need to start with a clear, face-on self portrait and a good collection of papers to use for the collage. Children are often surprised to discover that our faces are not symmetrical. This is a fascinating activity that shows them what they might look like if they were! Here's a fun game to play with new friends or in the classroom as a back to school activity. 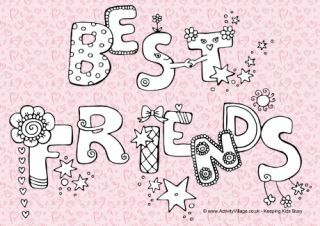 Everyone has to write down 5 facts about themselves, but there's a twist - only 3 are true, the other 2 are make-believe! Who can spot the true facts? Here's a really fun game to play in a group, and it's great as an activity to get to know people better. Everyone has to answer some simple questions, then all the pages get mixed up. Can you work out which answers belong to which person? Writing down the things that make you happy is such a useful exercise for all children - and adults too! In fact it is now quite fashionable to do this regularly, perhaps once a month or even at the end of every day. What makes me me? It's a question that children often ask - themselves or others - and it is a good one to encourage them to think about at the start of a school year or when making friends with a new group of children. This set of printables has 6 different boy outlines to choose from. There are 6 pages - and lots of different hairstyles - in this What Makes Me Me printout. Get the girls to think about what makes them unique - their physical characteristics, the things they love, their habits, their families, their ideas - and then write them on the faces. This fun What Makes Me Me fingerprint printable calls for a bit of thinking and then some fun wacky writing, following the whorls of the fingerprint image. You could tackle this What Makes Me Me worksheet during an "All About Me" topic, or perhaps at the beginning of a new school year.